The concept of public consolidation centre consists of flow consolidation from different transport companies, destinated to an urban sector. The carriers can deliver the goods destinated to this sector to a transit hub located in the close periphery of the city centre. An operator, neutral in regards of the different carriers using this consolidation centre, constitutes optimized delivery turns. These very dense turns, grouping flows from different transport companies, are done with « clean » vehicles. If the delivery turns are done with clean vehicles, we have a very positive environmental balance. Although, the experiences in many countries, and particularly in France, show that this principle doesn’t work very well and that the professionnal carriers don’t often accept to participate to this project. During many years, this model of multi-carriers delivery turns, the equivalent of consolidation centre, was used in some rural sectors. In many regions, one or two local carriers were delivering the goods on behalf of the major parcel distribution companies and were consolidating the turns. There was a financial interest in regions in which each carrrier didn’t have by itself enough flows to justify its own agency. The major urban centres do not correspond to this problematics. The major carriers, in traditionnal parcel / pallet distribution or small parcel / express, have in the big cities enough flows to justify their own agencies and distribution network. Why let another delivery company do this job ? The public consolidation centre principle is close to the origins of freight villages (gares routières), such as Sogaris, which, in the 1960s, consolidated the flows for Paris city centre and was doing the last mile delivery on behalf of the carriers. This experience was desastrous because the carriers gave to Sogaris only the most difficult freight deliveries (upper floor delivery, long products, etc.). 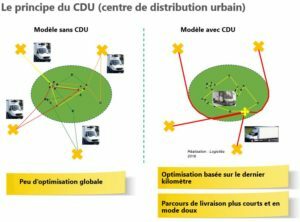 We can observe that the public consolidation centres which have a chance to succeed are the ones that chose as operator a transport group which already has a significant part of the flows destinated to the urban sector concerned (La Poste for example). 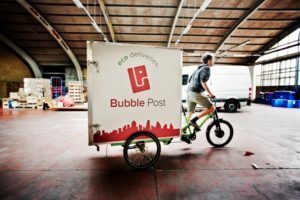 Will the other carriers accept to give their urban freight to a competitor ? The experience shows that nothing is sure. The first example of a public consolidation centre of that type will be Grenoble and we will attentively observe the results of this interesting experience. The second subject is that many plublic consolidation centres have closed or are in difficult financial situation due to the principle of an additional transhipment. Stopping the flows at the entrance of the urban area, re-organize the turns and deliver imply an additional cost. The jobs of last mile urban delivery usually have a very low margin. 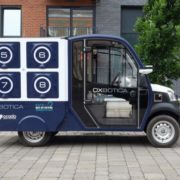 Adding a last mile delivery cost can only be accepted if the local regulation makes this consolidation compulsory or gives him a real advantage. It is the example of Monaco. It means that receiving a parcel in a city centrer costs more than in other areas and that the consumer, private person or company, will accept to pay this overcost, such as in mountain areas or remote islands, sectors for which carriers usualy apply additionnal taxes. Goods distribution in urban areas therefore becomes a public delivery service, that can be subcontracted to a private operator, within a legal concession frame. Very few cities in Europe are keen to decide this orientation, which brings an environmental advantage, but also creates high local oppositions and obstacles. These decisions can only be decided in exceptional situations, due to the geography or historic and touristic centres with high density. Another subject, the delivery particularities and IT problematics. A flow consolidation from different carriers makes necessary important IT developments, in a period during which competition difference mostly depends of IT solutions. Each carrier shows its difference with others mostly on technolgy and delivery service (time, appointment, etc.). Carriers propose multiple services, particularly with smartphone apps. Consolidation of flows from different carriers makes necessary a very flexible IT competence. The future of the French public consolidation model, experimented in several cities, from Lille to Annecy, Saint-Etienne, La Rochelle or Bayonne, depends of a solution which has to find a financial balance. It is probably not the job of local authorities to replace the company operator, which has to bring a service, finds and convince its customers and has a real stable economic situation. We have to keep in mind the fact that Public consolidation centres ar only one of the many solutions of urban freight, and maybe one of the most difficult to implement. 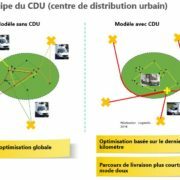 https://www.logicites.fr/wp-content/uploads/2016/11/CDU.jpg 612 828 Jérôme Libeskind https://www.logicites.fr/wp-content/uploads/2015/07/logo_website.jpg Jérôme Libeskind2016-12-05 18:28:572016-12-05 18:28:57Is the public consolidation centre a magical solution for urban freight ?